NPR’s 1A brings news of new book on CIW, story of Fair Food movement, to millions of listeners! Over the past month, word has spread about an extraordinary new book from the Dean of the Pardee RAND Graduate School in California, Susan Marquis. Marquis’s volume, titled “I Am Not a Tractor! : How Florida Farmworkers Took On the Fast Food Giants and Won” emerges from years of dedicated research, including hundreds of hours of conversation with CIW staff and auditors from the Fair Food Standards Council, and offers a history that stretches from the earliest days of CIW’s organizing all the way to the emergence of the Worker-driven Social Responsibility model today. You can find this exciting new book on Amazon here. So it is no surprise that the press is giving “I Am Not a Tractor” an enthusiastic reception. 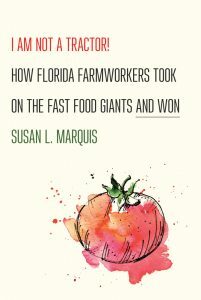 Just yesterday, the nationally-syndicated National Public Radio show, 1A, brought author Susan Marquis and the CIW onto the show for a wide-ranging conversation about the history of how the Fair Food Program was born, as well as the obstacles and opportunities the Program faces today. Although we encourage you to take a listen to the whole show, we have pulled a few highlights from the piece. It was a very informative story that got strongly positive feedback to CIW headquarters from listeners around the country, so if you didn’t get a chance to hear it the first time, you can listen to the entire story here. …The coalition saw that those corporate buyers—mostly grocery and fast food chains—held the real power to improve their conditions. Through public protests and boycotts, they convinced those buyers to pay a penny more per pound of tomatoes and to uphold a code of conduct prohibiting physical violence, sexual harassment, and other abuses in the fields. That comprehensive approach, Marquis says, transformed Florida’s tomato fields into some of the best agricultural workplaces in America, without the need for new legislation, regulation, or government participation. Her book is the product of years of independent research and personal interest. Essential support from RAND enabled her to begin writing during a two-month fellowship at RAND Europe. […] Q: Other journalists and authors have covered parts of this story. What were you hoping to add? […] Q: Is this a model that could work in other industries? A: It obviously applies to large-scale agriculture. It has expanded, in tomatoes, from Florida all the way up to New Jersey. It’s starting to move into peppers and strawberries. The Fair Food Program model has expanded to the dairy industry in Vermont: The Coalition of Immokalee Workers has been advising a group called Migrant Justice, who just signed an agreement with Ben & Jerry’s. But this model can reach much further, to factories and other low-wage workplaces in the global supply chain. Make sure to check out the full piece on RAND’s website! Drumbeat grows louder for FFP as proven solution for Time’s Up movement!